Dr. Kris Bly is a board-certified physician who works part time in the emergency room at Lower Keys Medical Hospital and owns a medical house call service called AM-PM House Calls Southern Keys. She graduated from Kirksville College of Osteopathic Medicine in Kirksville, Missouri and enjoys reading, swimming, snorkeling, and cross-stitching. Kris and her husband Donald (retired Canadian Army Infantry) live with their young daughter Amelia in Key West. Kris brings the highest level of care and commitment to our Clinic. 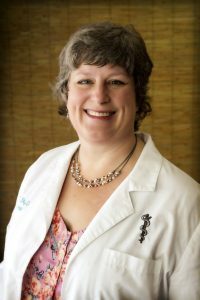 She has dedicated herself to listening to her patients’ concerns and developing treatment that benefits the “whole person.” She has a reputation on the island of compassion and excellent medical knowledge. Dr. Bly is a member of our Advisory Board and provides valuable advice and insight.